First, I must thank you again for all the feedback and comments on my blogs. Being an author can be a pretty isolated life so it’s always great to hear from readers! And while I thoroughly enjoy writing the Tom Kydd series – and my other historical fiction – it’s a pleasant diversion to put pen to paper (metaphorically) outside the confines of the structure of a novel. As well as regular blogs via BigJules for the past two years, I’ve been honoured to be invited to write guest blogs a number of times. Do send me any suggestions you might have for future blogs, either in the form of a question for ‘Ask BigJules’ or a general topic you’d like to see covered. I’ll pop a special thank-you gift in the post to any that I take up. And you can keep up to date with all the latest reviews and interviews via the News Page of my website. What happened to the Olla Padria column. I enjoyed reading it. 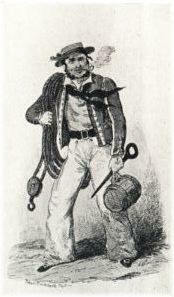 With the retirement of The Bosun this newsletter was discontinued but there are now regular BigJules blog postings on my website in its place. Below is a review I wrote on the Peabody-Essex Museum in Salem, MA. If you have not visited the museum yet, I urge you to go. As a fan of your Kydd series, I was especially enthralled with their maritime collection. A 23-foot-long model of the R.M.S. Queen Elizabeth was for me just one of the many highlights of the wonderful collections at the Peabody Essex Museum in Salem, Massachusetts. As a sailing aficionado, I was enthralled with their maritime collection, which included ship models, figureheads, paintings, scrimshaw, and curious items brought back from the Orient by Salem ship captains. The Peabody Essex also has exhibits of Japanese and Chinese art, including a two hundred year old two-story Chinese house that was painstakingly taken apart, brought from China, and reassembled in the museum courtyard. Paintings include works by Edward Moran, N.C. Wyeth, John Singer Sargent, Gilbert Stuart, William Bradford, Philip Reisman, and Norman Rockwell. A four hour visit was enough time for an introduction, but we will have to return, as the Peabody Essex has much more to offer.